Discover Beauty and Wellness Deals. Local offers and promotions from your favorite salon, spas, and yoga studios. Enter your email address, and we will send you information about how MyStylin can help your business grow. Advertise and create your brand. Whether you are a large or small business, it's important to market yourself with the latest technology. Your promotions and deals can target customers anytime, and all users in your area get notified when you create a new promotion. Customers pay you directly. There is no new hardware or setup needed to redeem a deal. Use MyStylin to send notifications to your loyal customers when you have new promotions. "Best app ever! Never let's me down." "Great new App. So many services offering good deals!" Great for all hair stylists, salon and spa owners, or anyone in the beauty and wellness industry. Find out more and sign-up for free at our business registration site. Find promotions and deals in the beauty and wellness industry. Search for hair, nails, massage, spa, tanning, yoga, wellness, and products. No payments are made in the app. Just go to the business and press the Redeem button when ready. Show the screen to the staff member. 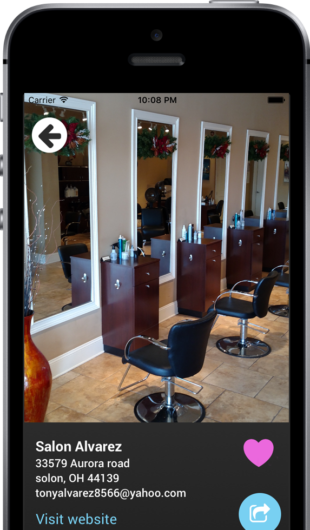 Receive updates from your favorite salon, spa, or studio. You'll be notified when a new deal or business is added. Search for nearby beauty and wellness businesses and see what their current promotions are.